Mario Venzago's Bruckner cycle is nearly complete. Of the nine major symphonies all but the Fifth have been recorded for the CPO label. Each disc in the cycle is accompanied by an essay by the conductor in which he lays out his views on performing Bruckner and why he feels it necessary to add yet another cycle in a crowded marketplace. The basic premise of Venzago's approach is that, despite the lack of explicit direction in Bruckner's own scores, an unjustified tradition of massiveness and solemnity has grown up around the nine symphonies. Against this tradition Venzago proposes a trimmer, more Schubertian tone, together with what he terms a "rubato-rich bar-line-free playing style". It is hard to know what to make of the idea of a playing style that is rubato-rich but bar-line-free. The whole point of rubato is occasional and expressive divergence from the basic underlying tempo and in most forms of music you need bar lines to establish a tempo. But of course the real issue is not how Venzago articulates his approach, but how it works in practice. 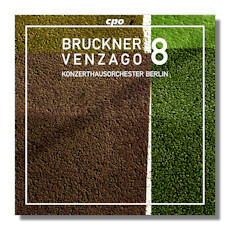 Venzago describes himself as impressed by what he sees as the "church opera" aspects of Bruckner's music. He allows himself dynamic liberties to allow "the sensuous opulence of the music to come out". The real question is whether those liberties add up to a coherent vision of the score. The challenge for Venzago is that Bruckner's music (in all his symphonies, but perhaps none more so than the Eighth) is built up a gradual progression through great blocks of sound. Venzago deliberately turns his back on the steady and disciplined tempi that many conductors use to impose order on Bruckner's huge soundscape. Does he have anything to put in their place? I don't have a clear answer. Vanzago's rhythmic fluidity works better in some movements than others. Of the four movements, the Scherzo and the Finale work best. The closing minutes of the Finale are very effective, despite some of the exaggerated accelerandos and ritardandi leading up to it. But the logic of the Adagio does not emerge and the build up to the grand climax of the movement lacks the architectural weight it deserves. Many listeners are likely to object to what they see as ghastly distortions of the musical line, particularly in the Adagio, but also in the opening movement. This recording of the Eighth is probably worth listening to, if only for the perspective it gives to the tradition of massiveness and solemnity. I'd be surprised if Venzago's Eighth had many converts, but at least it makes us appreciate what we might otherwise have taken for granted!